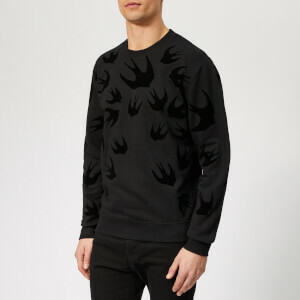 Men’s black sweatshirt with all-over contrast print from McQ Alexander McQueen. Crafted from a traditional cotton jersey, the pullover sweater comprises a crew neck, cuffed sleeves and a banded hem. Detailed with ribbed knit trims throughout and finished with a velvet-touch print showcasing the label’s signature swallow logo.